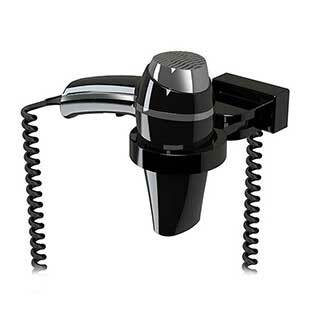 We supply a range of bathroom hairdryers in different styles and wattages. 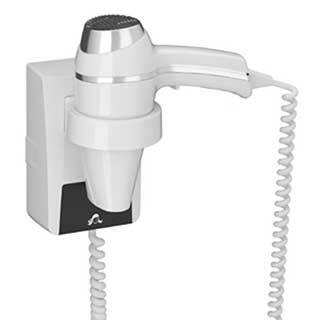 Bathroom hairdryers have been specifically designed for hotel bathroom areas and other situations where conventional hair dryers are not permitted. Bathroom hairdryers have an IP rating which designates which area of the bathroom they are permitted. All bathroom hairdryer units must be hardwired and installed by a qualified electrician to comply with Part P regulations. 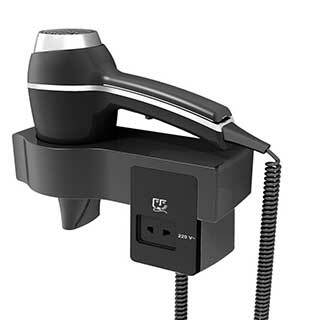 Bathroom hairdryers can be purchased with or without shaver socket. Our bathroom hairdryers range from 1000 watt to 1600 watt power output with various heat and speed functions. 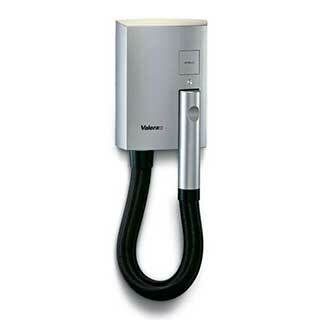 Order your bathroom hairdryers from www.supply2hotels.co.uk. 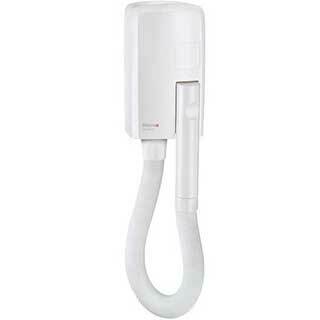 Wall mountable bathroom hairdryer, 1000 watt in white. Thermally insulated for use in bathroom. Class II IP44 Suitable for zone 2. Operated by hose movement - hose extends up to 1.5m. W140 x H460 x D150 mm. N.B. The unit must be hardwired and installed by qualified electrician to comply with Part P regulations. 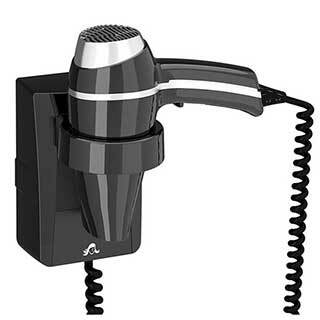 A modern ABS plastic black wall mountable bathroom hairdryer. 1400 Watt gun grip style. 6 drying settings: Air flow: 70 & 90 m3/hr. 3 temperatures (including cold). It has a patented light touch handle which switches on by simply picking it up. Valera Hotello 1200 watt hotel bathroom hairdryer in silver. Made in Switzerland, to the highest standard. Thermally insulated for bathroom areas. IP34 rated - suitable for zone 2. Protected against water sprayed from all directions. Starts automatically after removing handset and stops when replaced. Inbuilt thermal safety cut out. Hose extension up to 1.20 metres. Dryer and hose height, 580mm Projection 102mm. Cool to touch swivel hand grip. 1200w long life motor. CE approved. Dimensions W 190mm: D 102mm: H 580mm. Direct connection to electrical mains (hard-wiring). Connection with plug (soft wire). Fixings included. Very easy installation. Cool touch. Eco friendly. Super safe. Valera Hotello 1200 watt hotel bathroom hairdryer in white. Made in Switzerland, to the highest standard. Thermally insulated for bathroom areas. IP34 rated. Suitable for zone 2. Protected against water sprayed from all directions.1.2m extendable hose. Valera Hotello Club 1400 watt hotel bathroom hairdryer in white. Made in Switzerland, to the highest standard. Thermally insulated for bathroom areas. IP34 rated. Suitable for zone 2. Protected against water sprayed from all directions. Starts automatically after removing handset and stops when replaced. Inbuilt thermal safety cut out. Dryer and hose height, 580mm Projection 102mm. Cool to touch swivel hand grip. 1.2m extendable hose. 1400w long life AC motor. CE approved. Dimensions W 190mm: D 102mm: H 580mm. Direct connection to electrical mains (hard-wiring). Connection with plug (soft wire). Fixings included. Very easy installation. Cool touch. Eco friendly. Super safe. A modern black wall mountable bathroom hairdryer. 1400 Watt gun grip style with 6 drying settings, 2 airflow settings, 3 temperature settings. For safety the switch has to be depressed at all times whilst it is in use. 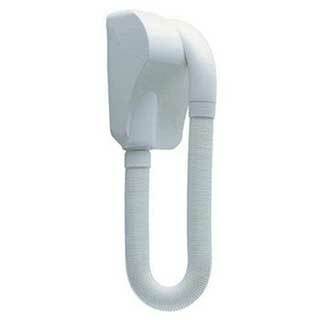 A modern white wall mountable bathroom hairdryer. 1400 Watt gun grip style with 6 drying settings, 2 airflow settings, 3 temperature settings. For safety the switch has to be depressed at all times whilst it is in use. 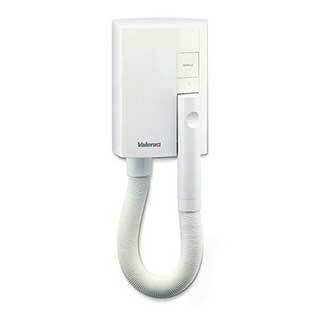 Valera Hotello Super 1500 watt hotel bathroom hairdryer in white. Made in Switzerland, to the highest standard. Thermally insulated for bathroom areas. IP34 rated - suitable for zone 2. Protected against water sprayed from all directions. Starts automatically after removing handset and stops when replaced. Inbuilt thermal safety cut out. Hose extension up to 1.20 metres. Dryer and hose height, 580mm Projection 100mm. Cool to touch swivel hand grip. 8 min. automatic safety timer. 1500w long life AC motor. CE approved. Dimensions W 150mm: D 100mm: H 580mm (incl hose). Direct connection to electrical mains (hard-wiring). Connection with plug (soft wire). Fixings included. Very easy installation. Cool touch. Eco friendly. Super safe. A modern black wall mountable bathroom hairdryer. 1600 Watt gun grip style with 6 drying settings, 2 airflow settings 70 and 95 m3/h, 3 temperature settings (including cold). For safety the switch has to be depressed at all times whilst it is in use. 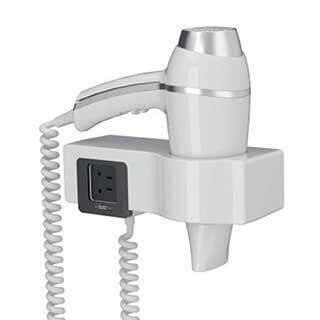 Valera Hotello 1200 watt hotel bathroom hairdryer with shaver socket in white. Made in Switzerland, to the highest standard. Thermally insulated for bathroom areas. IP34 rated - suitable for zone 2. Protected against water sprayed from all directions. Starts automatically after removing handset and stops when replaced. Shave socket 110-120v and 220-240v. Safety isolating transformer. Super safe UP34 rating. 8 min automatic safety timer.Hose extension up to 1.20 metres. Cool to touch swivel hand grip. 220/240v 50/60Hz. 1200 watt. Dimensions Width 147mm: Depth 140mm: Height 470mm. Weight 2.2kg. Direct connection to electrical mains (hard-wiring). 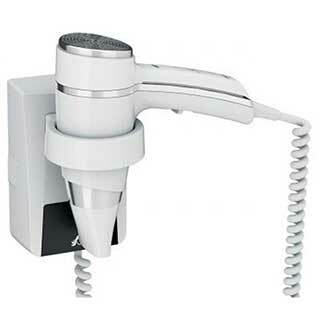 Valera Hotello Club 140 watt hotel bathroom hairdryer with shaver socket in white. Made in Switzerland, to the highest standard. Thermally insulated for bathroom areas. IP34 rated - suitable for zone 2. Protected against water sprayed from all directions. Starts automatically after removing handset and stops when replaced. Shave socket 110-120v and 220-240v. Extra long life AC motor. Super safe IP34 rating. 8 min automatic safety timer. Hose extension up to 1.20 metres. Cool to touch swivel hand grip. 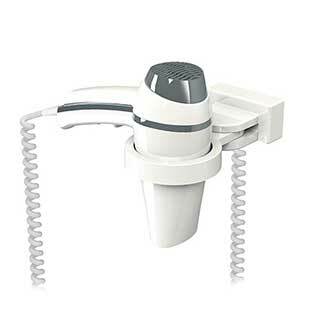 Stylish white bathroom hairdryer wall-mounted hairdryer. Available with single voltage saver socket or dual voltage shaver socket. Automatic activation when handle grasped, removable & directable concentrator nozzle, numerous drying settings, equipped with ionization system. 6 drying settings: Airflow (70 & 115 m3/h), 3 temperature settings (1 cold). IP21, can be installed in bathroom zone 3, Class II. Option: Universal single voltage or dual voltage shaver socket. Power supply: 230V, 50/60 Hz. Also available in black. This hairdryer must be hard-wired in and installed by a Part P qualified electrician. Guarantee 2 years (excluding use in swimming pools, spas & gyms).E.45.4. Stylish black bathroom hairdryer wall-mounted hairdryer. Available with single voltage saver socket or dual voltage shaver socket. Power supply: 230V, 50/60 Hz. Also available in white. This hairdryer must be hard-wired in and installed by a Part P qualified electrician. Guarantee 2 years (excluding use in swimming pools, spas & gyms).4.45.4. 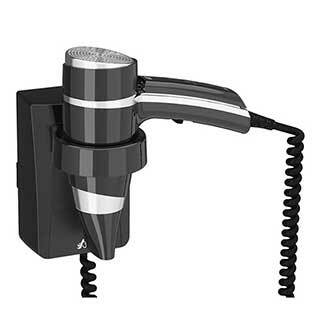 Sleek black hotel safety hairdryer – 1875w (also available in white). Automatic activation when handle grasped for extra safety Removable and directable concentrator nozzle. Delivered with a spiral power cord (35cm) + plug. Numerous drying settings / equipped with ionization system. IP21, Class 11. Options: Chrome wall support with locking system or drawer/wall mountable security system (see details or telephone for further information). For bedroom use. Can also be used in bathroom zone 2 if cord is not locked by support, or zone 3 if the cord is locked. Guarantee 2 years (excluding use in swimming pools, spas and gyms). Also available in white.E.41.5. 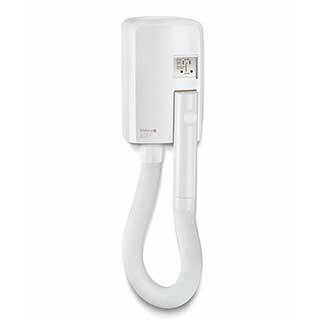 Sleek white hotel safety hairdryer – 1875w (also available in white). Automatic activation when handle grasped for extra safety Removable and directable concentrator nozzle. Delivered with a spiral power cord (35cm) + plug. Guarantee 2 years (excluding use in swimming pools, spas and gyms). Also available in black.E.41.5. 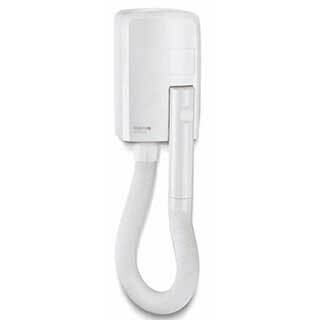 Stylish white bathroom hairdryer. 1876w wall-mounted hairdryer. Gun grip style. 6 drying settings: Airflow (70 & 115 m3/h), 3 temperature settings (1 cold). IP21, can be installed in bathroom zone 3, Class II. Stylish black bathroom hairdryer. 1876w wall-mounted hairdryer. Gun grip style.